We all know that a dorm room is not the most comfortable place to live, especially if you’re living on your own for the first time. I’ve found that the easiest way to make your room a little brighter and your ramen a little less depressing is a small window garden. 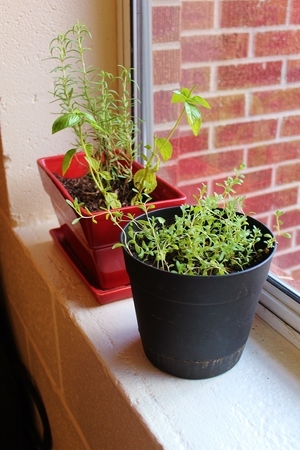 With plenty of plants that are easy to grow and maintain in a dorm room, a garden will make your room smell good, your 33¢ dehydrated noodles seem palatable, and your sense of accomplishment skyrocket. I warn you before you begin this project that these plants will become your baby—a delicious baby that takes little-to-no effort to care for, but a baby nonetheless. You get a sense of pride from watching dirt give way to tiny sprouts, and tiny sprouts give way to actual, living plants that you created with your own hands. It doesn’t seem like much, but looking at your tiny garden and knowing that you grew it yourself makes that test you might have just failed seem less important. Who cares about grades when you’ve created life? If you can bring yourself to support the capitalist pig for a moment, Walmart sells cute plastic planters for under a dollar that are the perfect size for a window garden. Or you could visit N.U.T.S. in Midtown (or any thrift store) and find glass or plastic window-sill-sized containers. Make sure your planter has some kind of drainage holes in the bottom, or you’ll drown your plants. If your planter doesn’t have a tray that catches excess water, be sure to pick one up or find a cute (thrifted) plate to fit under your planter. Of course, you’ll also need soil; a bag of Miracle Grow costs about $7, and the small bag I bought is enough for maybe 10 plants. So if you’re like me (i.e. cheap frugal), you can get a friend or two to split a bag with you. The best way to provide your plants with moist nutrients is to fill your planter with soil and then cover the soil with a few cups of water. Even the soil out with your hands and let it settle for a few hours. When that soil sinks down, add more on top of the existing soil and repeat this process until you have about two inches of space between the soil and the top of your planter. Since most people have limited space and experience, it’s probably best to start growing hardy plants that will be useful to you (meaning plants you can use as a substitute for a ramen flavor packet). This brings us to the exciting and magical world of herbs! The easiest herb to grow (read: “hardest to kill”) is rosemary. It can survive indoors or out, can go long periods of time without sunlight or water, and it’s delicious. Rosemary can be transplanted from an existing plant, so if you know someone who grows it, you should kindly get permission to cut a sprig from their plant to transplant to your soil. I know this sounds like a very serious and complicated process, and it is. Follow the steps below very carefully or all hope for your rosemary will be lost. 1. Make a hole in your prepared soil, about the depth of your finger up to your middle knuckle. 2. Put the rosemary sprig in the hole. 3. Loosely pack the soil around the base of the rosemary. And you’re done. That’s right, I lied about it being hard. Sue me. This same process goes for seeds and other transplanted plants, as well. Water your rosemary when the soil feels dry to the touch, and let it get as much sunlight as possible. It will take a couple weeks, but when it takes root you’ll start seeing new growth from your little sprig. And of course, make sure you read the back of any seed packets you buy to find out if your plant need more water than others. Don’t starve the poor things. 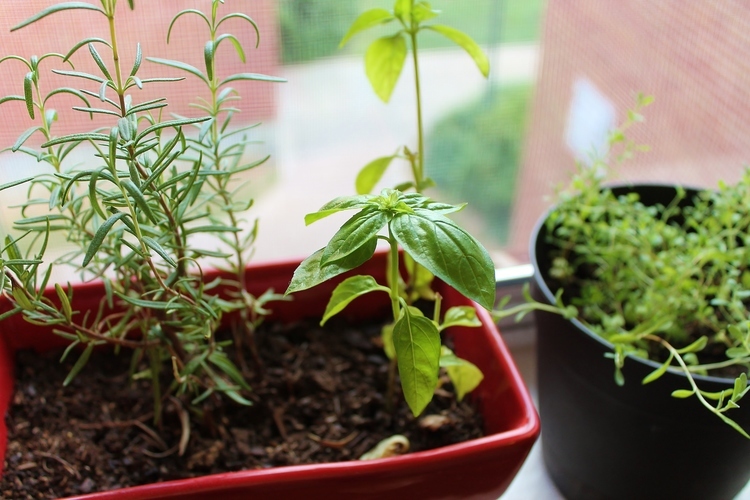 I grow basil and lavender in addition to my rosemary, which are all very useful, tasty, and easy to keep alive. 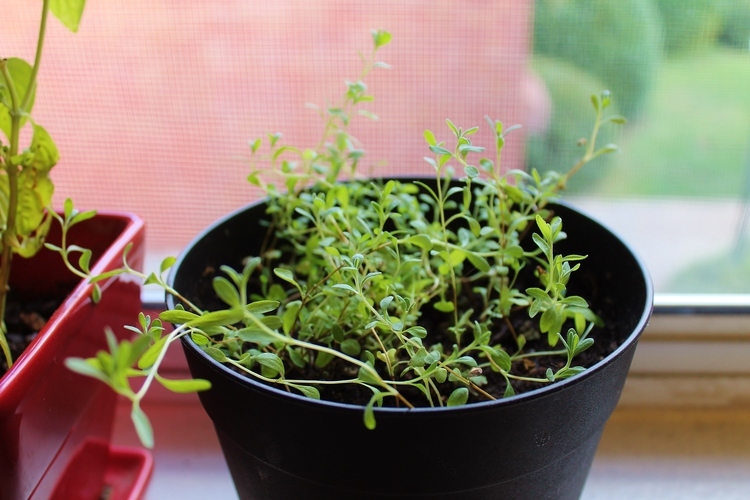 If these aren’t up your alley, thyme, sage (which makes wonderful tea), green onion, and parsley all grow really well in dorms. If you’re more ambitious you can even go for baby carrots or cherry tomatoes. There are also dozens of varieties of flowers that grow well in pots and indoors, so take to the web to find out which ones you want to grow. Now that you’re armed with all the know-how of a well-seasoned (pun intended) gardener, go forth and create life of the plant variety.